The bodies God creates are instruments for experiencing a fulfilling life on Earth, for doing good works, and for spiritual development. To do the work we are meant to do, our bodies need to stay in shape. We must maintain a sound mind, body, and soul. Yet in the modern world, it is all too easy to let one, two, or all three of these slip. Based on her New York Times best-seller, Look Great, Feel Great, in this compact listen, Joyce Meyer presents her 12-key plan to address the "self esteem drought" which perpetuates the habits that cause poor health. As she explores each of the 12 keys for good health, she offers five methods for improving our physical and spiritual wellness. Additionally, Joyce provides helpful resources, like the "Ounce of Prevention Checklist," for self-maintenance. Content is good in the book but the Narrator is so unexciting and just feels like a dull book. It's not the biok! the science to the Bible and how we needed to be reaching out to God and the Holy Spirit to help us on our journey. This is exactly what I needed to hear to set goals in all areas of my life. I loved it! So helpful getting mind in right place. A gift from God. Everything was broken down in simple to follow steps. A must read for anyone at whatever point you are at. A practical and user friendly tool for anyone who has allowed the 'issues of life' to derail them. As stated, it's sooooo easy to get caught up in the care of everyone else to the detriment of yourself and I believe this is one of the enemies favorite tactics against women because of their God given gift of nurturing. This book gently guises you back to health. I highly recommend it. Loved it! I hated when it was over. Very encouraging. Joyce Meyers is one of my favorite authors. I enjoy all of Joyce's books! This will give you a simple, yet complete action plan to a more healthy & fulfilling life. I have been in a rut after maintaining good health most of my adult life. I needed a boost and I think if found it in this audiobook. Wish me luck and say a prayer. Would you try another book from Joyce Meyer and/or Jodi Carlisle? What was one of the most memorable moments of Good Health, Good Life? It was very information, very good information and good points. Would you be willing to try another one of Jodi Carlisle’s performances? Did Good Health, Good Life inspire you to do anything? I did take some good information, but honestly the readers voice was not motivational at all, felt like a ready for a children's disney book. Sorry very good book but I could not get that much into it. Brought some good points very good and I could see Joyce Meyer reading it but I just did not get one bit inspired. I might just go buy the book and read it since the audio did not do much for me. 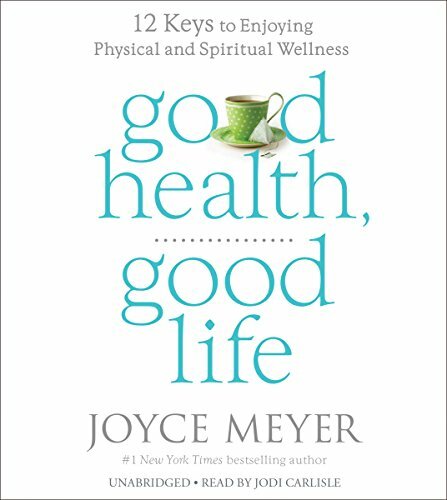 Love Joyce Meyer audiobooks,so couldn't get on with enjoy listening to good health,good life. Great book ,felt flat and bored trying to get on with the narrator. Given one star for performance only because I can't submit without rating.